I've had this brush for a while now, I bought the Real Techniques Core Collection when I was at IMATS a few months ago. I almost decided against buying them as I already had a foundation brush that I thought was OK. However IMATS hype and the fact it was reduced to about £16, paired with blogging peer pressure I decided to buy the Core Collection. I've got no idea why I've put off adding my two cents about the Real Techniques Buffing Brush. I'll start by saying that I really cannot emphasise how much I love this foundation brush, I've used it literally everyday since I purchased it and I just can't see myself using another foundation brush for a very long time. The Real Techniques Buffing Brush is a flat top kabuki style brush made with synthetic fibres. I think the orange handle looks a bit naff, I tend to prefer my brushes to be black and simple as it fits with the rest of my collection (mainly MAC or Sigma Brushes). 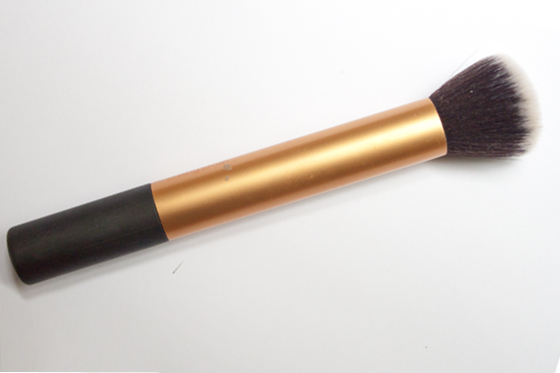 When I use the buffing brush, my foundation applies flawlessly and with very little effort. It glides onto the skin without becoming patchy or streaky, which means it takes hardly any time to make your base look perfect. Its the perfect "in a rush to get ready in the morning" brush. I use a mixture of stippling and buffing, By stippling I'm able to build up product and coverage on my problem areas and then buffing in a circular motion to blend it out. A few days ago I used a MAC 187 to apply my foundation a as my brushes were dirty and it took so much more time, effort and buffing to get the same finish as I do with my Real Techniques Buffing Brush. At first, I did thin everyone raved about the brushes because obviously being made my Sam Champman of Pixiwoo fame, the community was going to support her and try them out. But now I have them and look past blog hype, Honestly if you wanted to invest in a foundation brush get this one! Unfortunately you can't buy it alone, and you have to buy a whole kit thats around £21. I really like the contour brush from the kit, the other two are a bit so so! However its really worth it for the quality of the buffing brush alone! They are currently in the 3 for 2 promotion in boots! i agree i really don't like the orange handle, other than that they sound great!! This brush really is the best in the lot, i LOVE it! I just wish they sold more of the brushes on their own.. I don't have this brush, I have eco tools brushes, which are quite good. I've always wanted The Body Shop brushes, because they're so soft, but this one sounds better, so maybe one to add to the wishlist! I think it is disappointing that they're not available to buy separate, as I don't think I'd get much use out of the other ones in the set. I have the blush brush and I lvoe it but might add this to my collection too! I really want to try Real Techniques brushes, they're so raved about and I feel left out! I really don't like the way they look though :/ the handles are so chunky! I really could do without spending £20, and then being sucked into the 3 for 2 offer too but I NEED this brush!!! I would really like to try that brush. Such a pity that is not sold separately. At the moment I only have the stippling brush, it's the first time I ever had one. It is quite nice :).